Next month, British television viewers are in for a grand treat when Are You Being Served? returns to their screens after an absence of over 30 years. Back left-right: Arthur Smith as Mr. Harman, Jorgie Porter as Miss Croft, Justin Edwards as Mr. Rumbold and Mathew Horne as Mr. Grace. 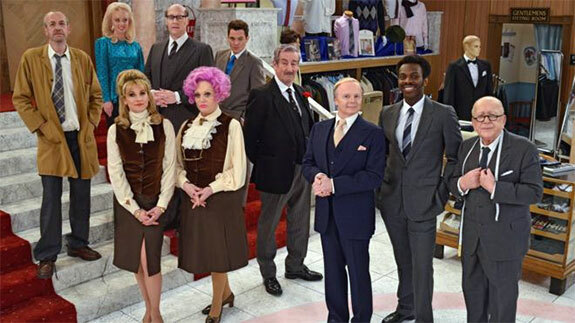 Front left-right: Niky Wardley as Miss Brahms, Sherrie Hewson as Mrs. Slocombe, John Challis as Captain Peacock, Jason Watkins as Mr. Humphries, Kayode Ewumi as Mr. Conway and Roy Barraclough as Mr. Grainger. The one-off revival of the show that first aired in the U.K. in 1972 is just one of the shows that the BBC have revived in celebration of the 60th anniversary of the first televised sitcom, Hancock’s Half Hour. Some of the cast members in the new AYBS? might be recognizable from shows you’ve seen on MPT. Justin Edwards, for instance, who plays Mr. Rumbold was in the Father Brown episode "The Daughters of Jerusalem," and John Challis, who plays Captain Peacock, guest starred as a fake jewel thief in Last of the Summer Wine. Original cast members of AYBS? One of the most surprising casting decisions in the revival series was to have a young actor portray Young Mr. Grace. Matthew Horne plays the role as the grandson of the original Young Mr. Grace. 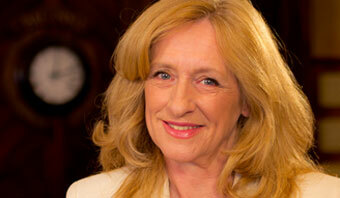 You might have seen Horne in a season two Death in Paradise episode. There’s also a new character added, Mr. Conway, played by actor Kayode Ewumi. Taking on the role of the much loved Mr. Humphries is Jason Watkins who plays Constable Patterson in Lark Rise to Candleford. Talking of Lark Rise, on August 16 we bid farewell to the series, when the fourth and final season concludes. There’s no word yet by the way as to whether this one-off revival AYBS? episode will be offered over here. But you can, of course, see the original Are You Being Served? every afternoon at 2pm on Afternoon Tea.